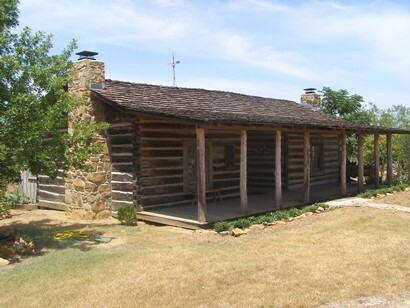 Settlement here began in the 1840s by German immigrants. Homesteads were scattered at first. 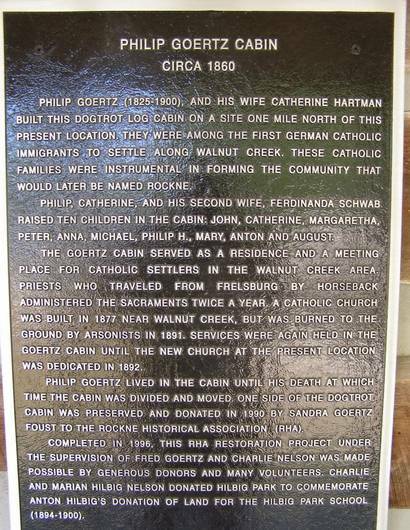 Phillip and Catherine Goertz along with Michael and Rebecca Wolf, donated land for the area’s first church in the 1880s. Previously services had been held in the Goertz home. 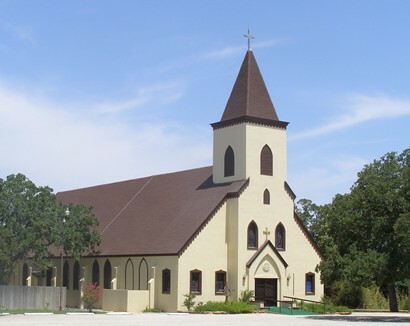 The new structure burned in 1891 and a second church site of ten acres was donated by John and Rosina Lehman the following year. By this time a community called Walnut Creek was forming. 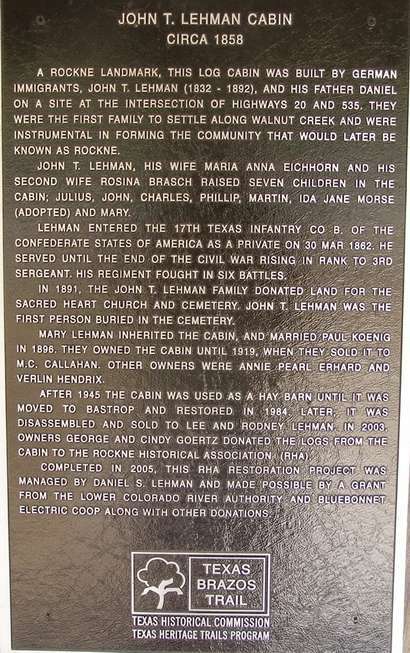 Later the town took the name of the Lehman family – one of the first to settle here. 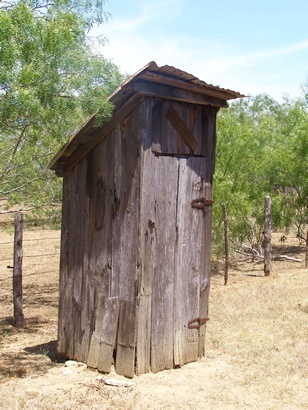 The town was also known as Lehmanville. 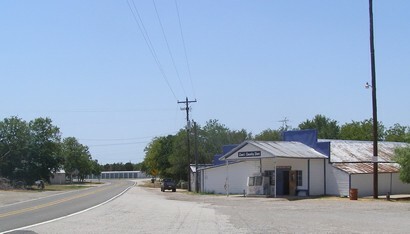 The town of Lehman was granted a post office in 1900 and operated as such until 1903. 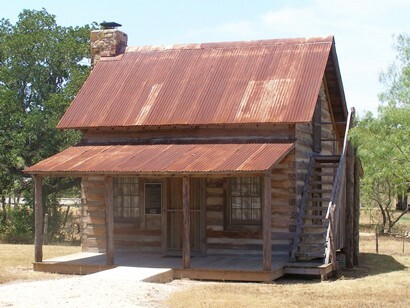 The community was later known as Hilbigville after businessman W. M. Hilbig, another early settler. With its strong Catholic foundation, the community closely followed the games of the University of Notre Dame. 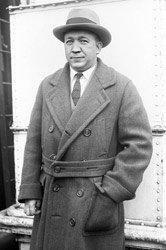 The popular team was coached by Norwegian-born Knute (“Let's win one for the Gipper”) Rockne. 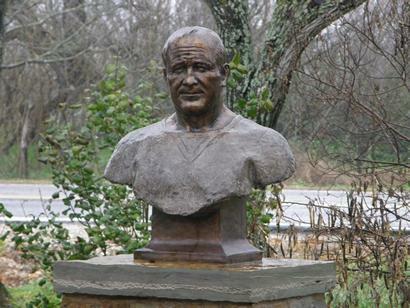 When Rockne died in a Kansas plane crash in 1931 (on his way to assist in a movie about him) the country was shocked. 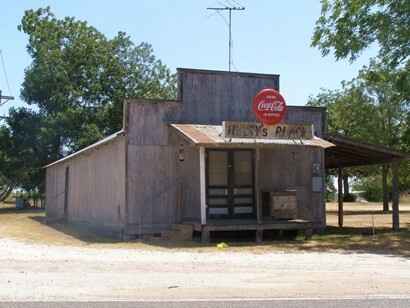 The schoolchildren of Hilbigville, Texas took a vote and the town was renamed. 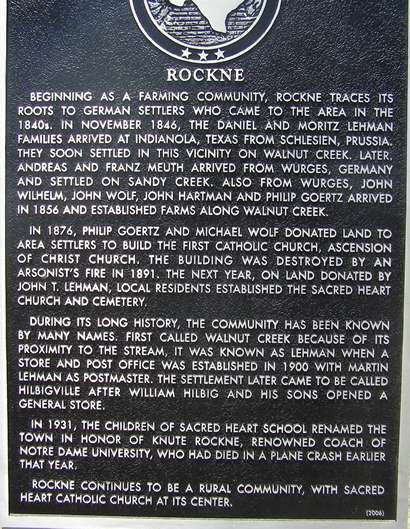 Rockne was always underpopulated. During the 1940s it reached as high as 280, but settled in at 150m for the 1950 census. The population was 400 for the country’s Bicentennial and it remained there for the 2000 census. In 1988 Rockne became the focal point of the issuing of a Knute Rockne commemorative postage stamp.